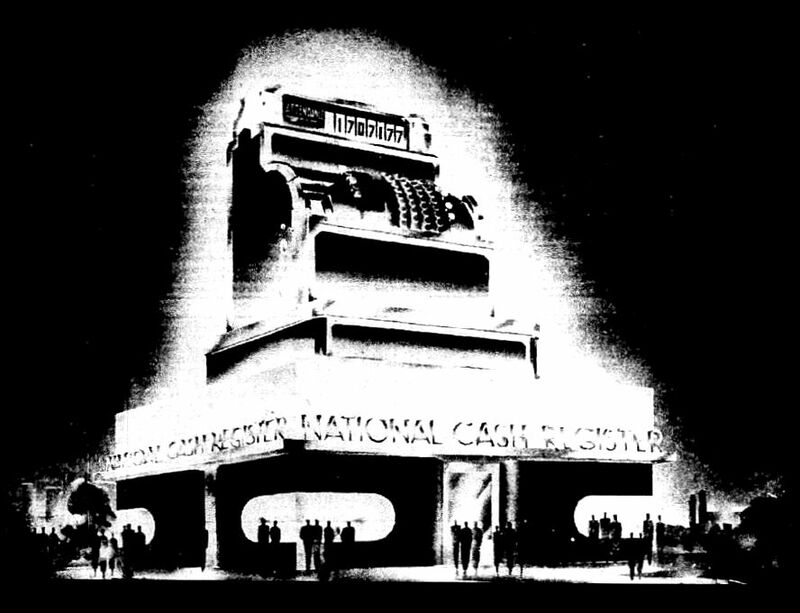 What’s not to love about a 65-foot-tall cash register? And how appropriate that this larger-than-life attraction was featured at the bigger-than-big Texas Centennial Exposition at Fair Park in 1936. 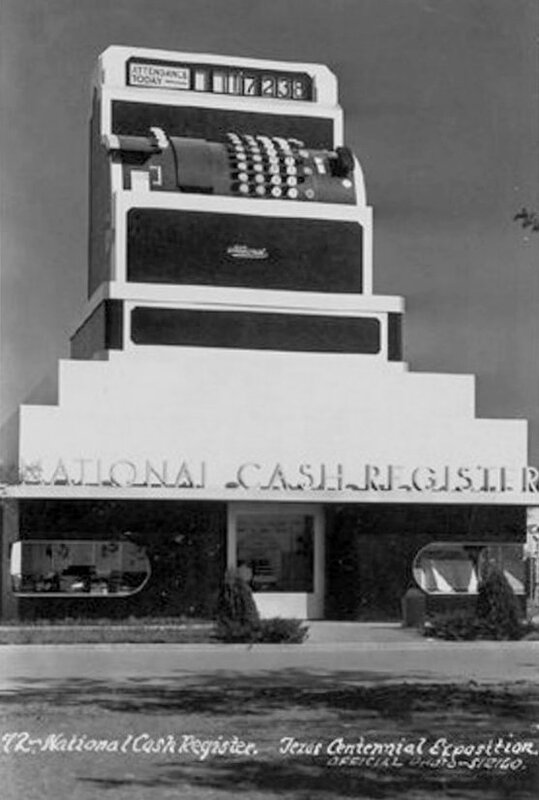 This building, shaped like a very large National Cash Register (made under the auspices of noted designer Walter Dorwin Teague), served two purposes: its interior was an exhibit space to show off the company’s line of cash registers, and its exterior served as a giant tally board which was updated hourly to display the number of Centennial visitors. 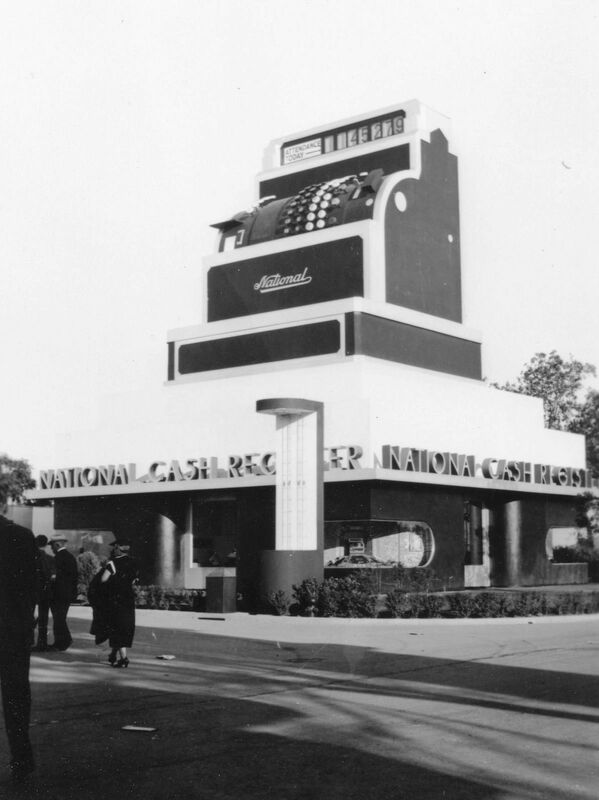 A similar giant cash register had been a popular feature at the Chicago World’s Fair in 1933/34, and it was decided to commission one for the Texas Centennial (another one would show up at the New York World’s Fair in 1939). At the risk of turning into a blog-realized Monty Python sketch (“This is Uncle Ted at the front of the house. This is Uncle Ted at the back of the house. And this is Uncle Ted at the side of the house….”), let’s take a look at this great big cash register from several slightly different angles. Here it is under construction. Here it is glowing in an ad with a tantalizingly dynamic illustration (click to see the illustration larger). Towering in the air the height of a six-story building, this is the largest National Cash Register the world has ever seen. In giant figures at the top of the register Centennial attendance is recorded. Look for this outstanding feature of the Texas Centennial. See the electrical recording device accumulating the total of all attendance as the turn-stiles click, at each gate. The huge figures at the top of the giant register tell the whole story of the Centennial attendance. A modern National Cash Register in your store will give you the whole story of what is happening in your business. Here it is in a photo that, admittedly, looks a lot like the top photo — but take a closer look — those shrubs have gotten shrubbier. UPDATE: Another photo of a somewhat stoic-looking Benge is here. An entertaining article about Mr. Benge’s big day is here. I sure hope Fred didn’t mind being described as a short and bald-headed jobless mechanic. And here’s the “official photo,” which is a little bland and dowdy, but at least you can see what it looked like head-on. And here it is, as seen from the other side of the lagoon. 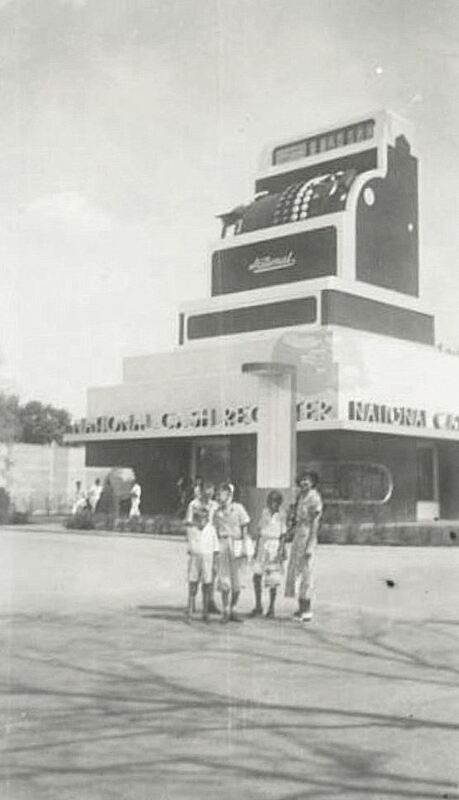 You can see it in a detail from a photo of the Centennial fairgrounds I posted previously (see that post here) — the cash register is circled at the top right. I’ll just keep adding new photos as I come across them. Below are two photos from the George W. Cook Dallas/Texas Image Collection, DeGolyer Library, SMU (info is here and here). One of them shows a family standing in front of it — since Big Tex hadn’t arrived on the scene yet, this was as good a giant “thing” to stand in front of as anything! Top photo is from The Year America Discovered Texas: Centennial ’36 by Kenneth B. Ragsdale (College Station: Texas A&M University Press, 1987); the photograph is from the collection of Texas author Elithe Hamilton Kirkland (Love Is a Wild Assault) who worked as the director of school publicity for the Centennial. 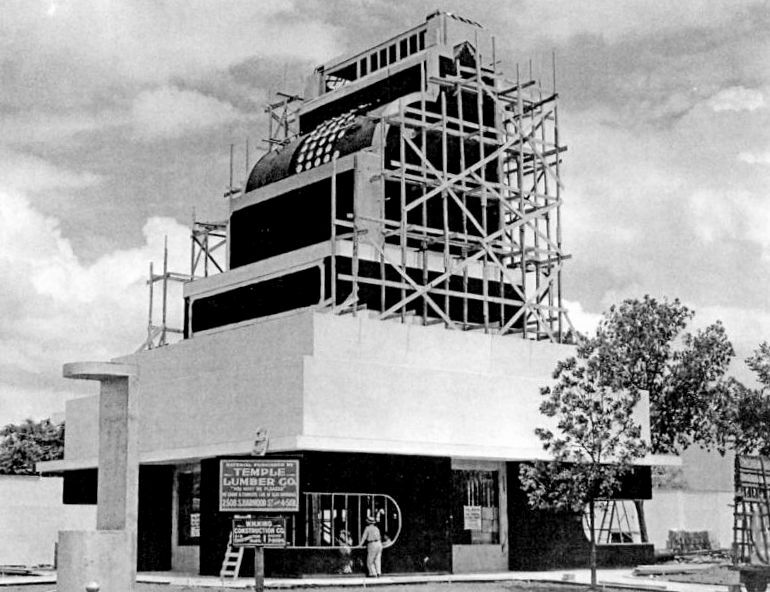 The State Fair of Texas Archives photo of the cash register under construction is from Fair Park by Willis Cecil Winters (Charleston, SC: Arcadia Publishing, 2010). Another photo of the NCR register can be seen in Winters’ book here — in the bottom photo, it is the dark square in the background, left of center — you can see how it towered over everything around it. The “shrubbier” photo is in the collection of the Dallas Historical Society, but I found it here, not identified as being the one at the Texas Centennial (if you click the picture in this interesting article, it will be super-super-gigantic). 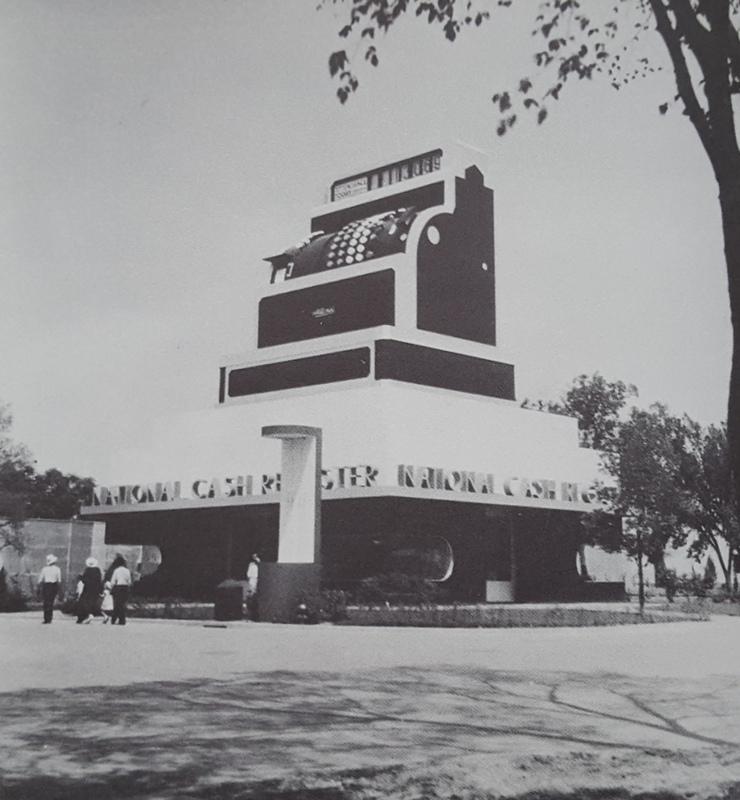 Walter Dorwin Teague (1883-1960) was the man who not only designed the National Cash Register exhibit building, he also designed other Centennial-related attractions, including the Ford Building and the nearby cool-looking new-concept moderne Texaco station (at Commerce & Exposition). Read about him here. 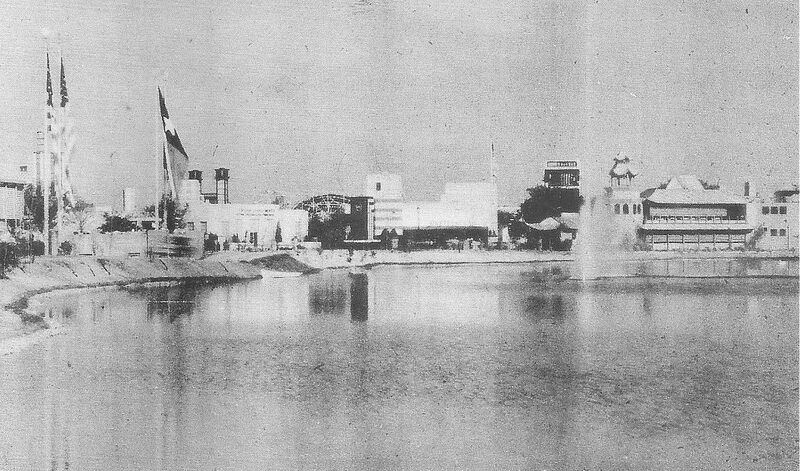 There were hopes that the Texas Centennial Exposition would attract in excess of ten million visitors over its six-month run, but the final numbers were just under six-and-a-half million. Pity. We had that great big tally machine sitting there and everything. Waiting. I love that typewriter — and it works! Thanks for Noah’s map! I love the Benge photo – back then, when it was possible to commit a crime in one county and “escape” to the adjacent county, get a job, and prosper for under a new identity…well, I can think of one possible reason Mr. Benge might’ve been non-plussed at all the attention! That is EXACTLY what I was thinking, Steve! That would be a great plot for a Depression-era Paper Moon-ish comedy. (Get Bogdanovich on the horn!) I’ve updated the post with links to another photo of Mr. Benge, sitting in a rickshaw, and an article about his jam-packed whirlwind tour of the park (which included a meeting with one of the “exotic” dancers — no pictures of the two together were taken until his wife back in Oklahoma wired written permission!). Gonna send this to my son who works for NCR in Plano! Perfect! Hope he enjoys it! The major problem with the official photo is that it makes the cash register look like a theater flat. Not good. Yeah, it’s pretty blah. And it doesn’t even give you an idea of the scale of its size. My dad turned 14 years old the summer of the Texas Centennial, lived a short streetcar ride away, and attended the event dozens of times on a season pass. He told me he always entered at the 2nd Ave. entrance just under the big cash register. Just as he rolled through the turnstile he’d look up to see the register turn over a number, registering his attendance that day. He wrote “his” daily number on the back of a ticket stub and in the Centennial scrapbook he kept. By the way, the figure in the DMN cartoon is Ol’ Man Texas, a character he invented to embody the Texas spirit. Ol’ Man Texas appeared in Knott’s cartoons for more than thirty years. Every day of Flashback teaches me something new about my city or brings a smile of recognition. Thank you! Thanks for this! I thought the register only updated hourly — with every update being happening like a telethon tote board — all the numbers flipping over every hour on the hour or something. I think being able to look up and seeing YOUR number adding to the history-making millions would have been kind of exciting. (ANd to have had a season pass to the Centennial!!) When you wander around the DMN archives as much as I do, it’s hard to escape Ol’ Man Texas! I hope Knott made some money on licensing — the DMN used the character EVERYWHERE, even in ads. Great article! Do you have any idea what happened to the cash registered? Was it actually part of the structure or just sat on top of it?….I’d love to have it as a conversation piece! Ha! It would look great in the backyard, wouldn’t it? 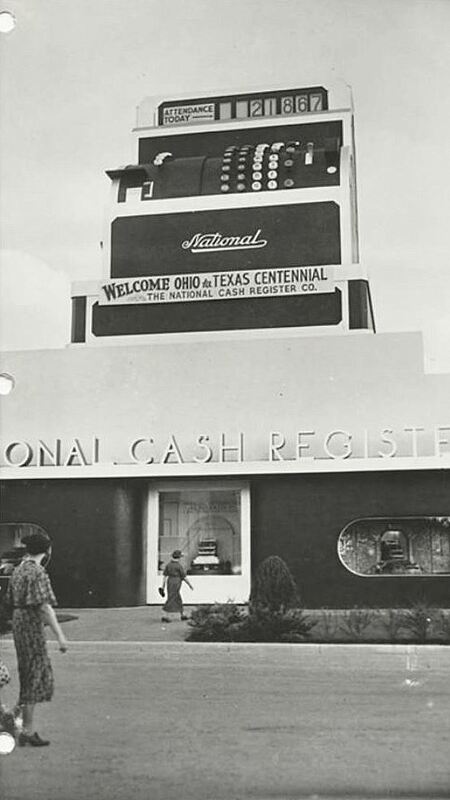 Most of the structures at the Texas Centennial were meant to be only temporary, and most were torn down at the end of the Centennial’s run, including, I assume, the giant cash register. In the under-construction photo, there’s a sign at bottom left that includes the name “Temple Lumber Co.” Their sawmill was in Pineland, in deep east Texas between San Augustine and Jasper. I was born there in 1951, in the Temple Lbr Co clinic just off Temple Ave. Altho the company itself disappeared in 1956, you can still find the Temple name in Pineland on the library and city park and, yes, still on the main drag. Just wish I could read the rest of what’s written on the sign. What a wonderful site – thank you! Do you know where I could access a comprehensive list of the Texas Centennial buildings that were demolished and the reasons given for their destruction? Thank you! I know a lot of the buildings were torn after the Centennial (or the Pan-American Exposition the following year), but I don’t know of a list. 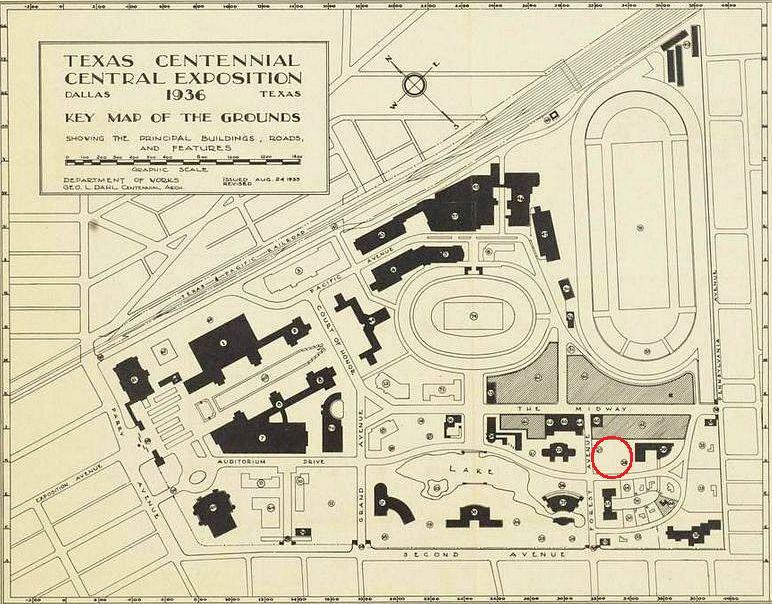 I was recently looking through the book Fair Park Deco and noticed that there were “bios” of several of the individual buildings, which included their post-Centennial/Pan-Am Expo fate, but it was not comprehensive.